I finished reading Things I Should Have Told My Daughter by Pearl Cleage, and I felt an urgent need to write.... so, here I am! I was first introduced to Pearl through her book What Looks Like Crazy on an Ordinary Day. I read this book, I believe back when I was living in Detroit, so that must have been over fifteen years ago. I have been in books stores where Pearl have read from her books, answered questions, and signed her autograph, and she is quite fascinating to interact with. Reading this book, I had to get use to reading diary style writing, but once I got the hang of it, I really, really, really was intrigued by it. I ain't been living...What am I waiting on? Is there an happily ever after? Pearl shows that she has always had a true commitment to writing. She has written speeches for public figures such as Maynard Jackson, former mayor of Atlanta. She has written plays, and many of her plays have been performed. She even worked on a film with Richard Pryor. She's been to some of the best concerts where performers such as Bob Marley performed. She's met Rap Brown, Muhammad Ali, Stokely Carmichael, Malcolm X, Dr, King, Coretta Scott King, Andy Young, Julian Bond, Coleman Young etc. And, her novel What Looks Like Crazy on an Ordinary Day was an Oprah Book Club Book...My People, I got to get busy! I really am a sucker for love and happily ever after; I am! Pearl was married to a public figure, they had a child, and divorced. After the divorce, Pearl seemed to be in constant pursuit of true, safe love but was getting it from all the wrong places such as married men. As I was reading Pearl's thoughts on love, I thought a lot about if happily ever after really exists. It seemed like there would be no happily ever after for Pearl that involved love with a man. However, she met a friend in 1971, they shared a lot of common interests, and without realizing it, they fell in love, got married in 1994, and in Pearl's words "so far, so good!" So, maybe there is a such thing as an happily ever after. Let's get busy living our lives and being in love!!!! Thanks for stopping by and leaving a comment.. Come back again soon! I didn't know much about her writing, but I got a chance to hear her speak at the Decatur book festival this past fall. I knew then that I've been missing out. She is one that I feel like are in this group of "underground' writers. They've been writing for years, they have loyal fans, but outside of that group, not many people know about them. J. California Cooper is another writer that I feel that way about. I have not yet read anything by her either but In Search of Satisfaction is on my high priority list. Shannon, you must read anything by J. California Cooper. Her writings read like someone is telling you a great story. She has that Zora Neale Hurston kind of style. 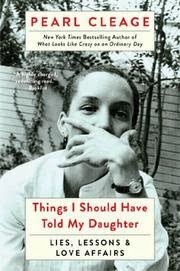 Pearl Cleage is one of my favorite authors, and I haven't read this one. Guess what I'm downloading today? Yes, this lady is incredible!